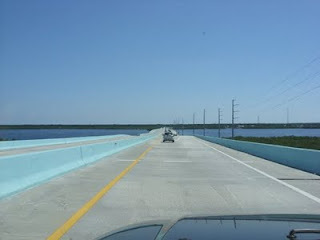 Once upon a time, I made my trip to the Florida Keys. There is a very stark break between the mainland and the Everglades in Florida City. Everything simply "Stops". You get past that and there are a very few businesses way off in the middle of nowhere. A cement factory and a quarry come to mind. A marina is just on the other side of the Monroe county line. But until you get to Key Largo, there's practically nothing but grass and nature. And this one massive scar through the landscape called US1. Granted it is a scar, but you actually need it there to get to the Keys. I am sure some people who are more ecologically aware would say that it does not belong there, nor do we in an ecological niche like those beautiful little jewels, but there are also people that would argue that nobody should live below the I-4 line where the land ceases to be land but more like a swamp. Like I said, I'm not that ecologically aware. My own feeling is don't expand it, and contract development in the keys where possible. But no draconian solutions, please. They are beautiful and we can enjoy them if we play nice with nature. Just before you go onto the island that Key Largo is on, there's one big deep water gap. A "Cut" so the larger boats can go into or out of the Florida Bay. That is at what is now the Jewfish Creek bridge. I realize I am being a small bit imprecise, but grant me that. Since the old drawbridge was replaced years ago, they built an improved structure and then the bridge we have now. The bridge itself is kind of minimalistic, maybe a bit stark, and painted in aqua blue, which is befitting of a place as knock down beautiful as the keys. One of my earlier trips I took a picture and wrote about it. For some strange reason in all the 8 or more years that I have been writing, that particular article gets read frequently. What I did was revisit it. I was down there for my birthday, a few days later. Knowing that I was going there, I brought my little video camera for the trip. Hopefully this video will satisfy the area's fans. Hopefully my color commentary won't offend too much and that my very shaky hand is not too awful. But for now, I present the video. For your pleasure or disdain. How About a Scientific Greats Reunion?